Prawns in a dry medium spiced sauce served on a deep fried pancake. King prawns in a dry medium spiced sauce served on a deep fried pancake. A Bangladeshi speciality. A fillet of Ayre with fresh mint and coconut chutney. Succulent flaked fish in a cutlet, sauteed with chillies, garlic and coriander. A house special. Chicken marinated in yoghurt & a special blend of spices and cooked in a charcoal oven. Fresh duck marinated and then barbecued in the clay oven. Served with a special sauce. Triangle shaped savoury filled with spicy minced lamb or vegetable than deep fried. Boneless chicken marinated in yoghurt and a special blend of mild spices. Chopped onions mixed with fresh herbs and flour & deep fried in vegetable oil. Boneless chicken cooked in a specially prepared home made spicy & sour sauce. Cottage cheese tossed with ginger, green chillies, onion & mix peppers. Spicy hot chicken wings marinated in ginger, garlic and fresh green chillies. Marinated all tandoori spice, cooked in charcoal oven. Lamb marinated in yoghurt and a special blend of mild spices and barbecued over charcoal. Chicken breast marinated with butter egg cheese and light spice cooked in tandoori oven. Salmon marinated in yoghurt and a special blend of mild spices & barbecued over charcoal. Tender lamb chops matured in yoghurt, cream cheese and ginger. Served with salad. Minced lamb blended with spices, tomatoes & onions grilled in the tandoori oven. (4 person) Combination of mixed starters. Finely minced lamb garnished with rich spices and fried in vegetable oil. Sheek kebab and chicken tikka, lamb tikka, served with salad. Minced lamb topped with omlette. King prawns marinated in yoghurt, fresh coriander and mustard. A mixed meat, chicken, and seafood biriani, another House speciality. Stuffed with spiced and vegetables. Mild, tender pieces of chicken. Cooked with fruits in a sweet creamy sauce. Tender pieces of chicken cooked in butter flavoured with our own special selection of mild spices. Tender lamb or chicken in a special cream sauce with almonds. 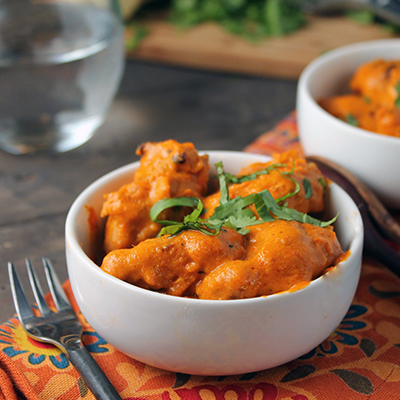 Medium tandoori chicken off the bone with minced lamb in fresh herbs & spices. Mild, succulent king prawns cooked with mild herbs & spices in a creamy sauce. Grilled chicken with onions, peppers and tomatoes tossed in a hot wok with light spices. 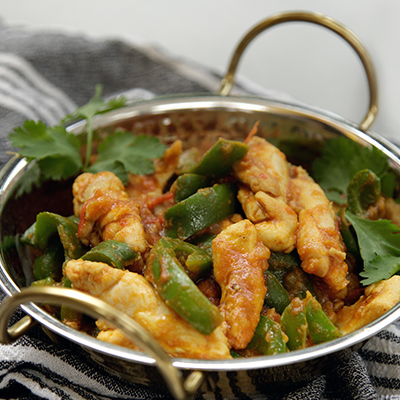 Chicken or lamb cooked with naga chillies from Bangladesh with distinctive fragrant, very hot dish. Chicken or lamb cooked to perfection with onions, peppers and a sauce consisting of yoghurt, tomato puree, crushed garlic, ginger and a unique blend of spices. Pieces of chicken breast cooked in mustard seeds, curry leaves, coconut milk, garnished with cream of coconut. Marinated chicken tikka and potato, medium spicy cooked with fresh garlic, onion & tomato. Lamb cooked in an aromatic blend of spices seasoned with lime and dry red chillies in a dry thick sauce with an essence of pickle. A thick sauce with medium spices and herbs, served with crisp potato fried in butter. Cooked in a light, thick hot spicy sauce with whole cumin and ginger. Marinated chicken tikka cooked with fresh extra garlic, cheese, chilli & coriander. Marinated fillet chicken cooked with caramelized onion, spring onions & pure farm honey. Fairly hot with garlic and ginger, a traditional dish (Vindaloo is very hot). Cooked with fresh spinach to give a distinctive aroma and flavour. 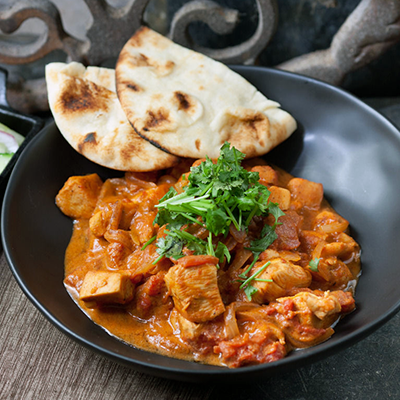 A distinctive combination of lamb or chicken tikka, tomatoes, onions & spices. 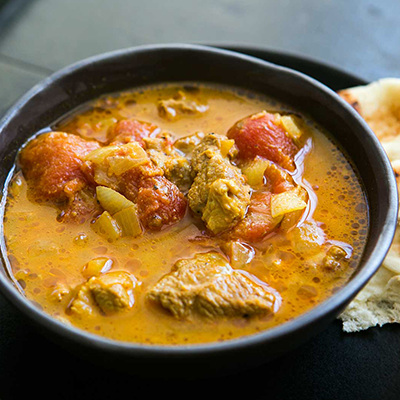 Lamb or chicken cooked in special dry sauce with tomatoes, onions & spices. A wonderful combination of fresh lamb cooked with ginger, green herbs & fresh green mint. King prawn cooked with fresh spinach a superb combination. A dry distinctive combination of king prawns, tomatoes, onion and spices. 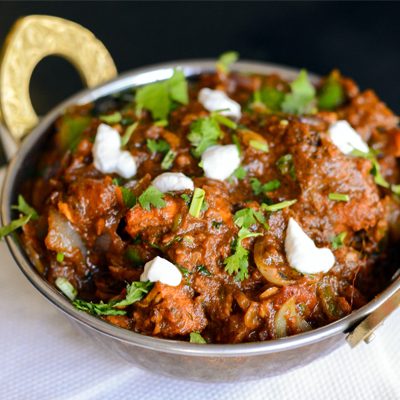 Tender lamb or chicken from the tandoori oven, in a spicy hot jalfrezey sauce. Succulent king prawn cooked with spices and methi leaves (fenugreek). 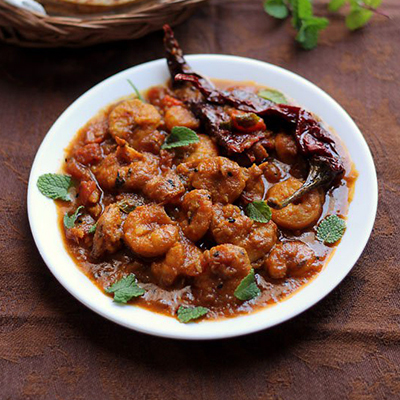 King prawns from the tandoori oven, in a spicy hot jalfrezey sauce. Fresh prawns marinated of several hours in a home made sauce, selected herbs & spices, barbecued over flaming charcoal on the tandoori, then finished in an enriched massala sauce. Tender pieces of lamb or chicken tossed in Korai, in dry sauce and garnished. Prawns with fresh spinach and spices. Succulent king prawn from the Korai. Tender pieces of marinated lamb or chicken from tandoori then finished in the Korai. Spiced prawns cooked & prepared as above. Succulent lamb or chicken with whole spring onions and herbs. Lamb or chicken with tomatoes, onions and fried in a special sauce. A sweet and sour hot curry, with lentils. A high spiced dish of king prawns prepared in an enriched thick sauce for a sweet and sour hot taste. Tender pieces of lean duck served with a richorange flavoured sauce. Tender pieces of boneless duck cooked in karai with fresh ginger, garlic, tomatoes, onions & capsicum. Diced lean duck marinated overnight, barbecued in the tandoori then finished in an enriched massala sauce for a truly dazzling flavour. An exceptional & spicy, combination of diced lean duck in a sauce of garlic, ginger & fresh green chilles. Hot! A wonderful tasty dish similar to jalfrezey but with less chilli and the addition of coconut and cream for a more delicate flavour. Duck cooked with naga chillies from Bangladesh with distinctive fragrant, very hot dish. Whole fish on the bone, marinated in a secret blend of spices and herbs then fried with onions, coriander and green chillies. Slices of King of Bangladesh fish known as Ayre, marinated overnight and served in a wonderful onion flavoured sauce. Fillet of ayre in a terrific hot spicy sauce of green chillies, turmeric, garlic and ginger. Fillet of Ayre cooked in the korai with fresh ginger, garlic, tomatoes, onion, capsicum. Bangladeshi fish known as Boal cooked in selected spices and coriander and green chillies. Slices of Bangladeshi Boal fried with tomatoes, onion, coriander and diced green peppers. On the bone chicken marinated and baked in tandoori. Chicken pieces marinated and baked in tandoori. Lamb cubes marinated and baked in tandoori. Salmon pieces marinated and baked in tandoori. 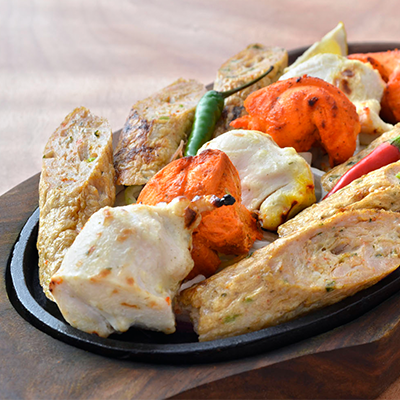 Large pieces of chicken / lamb skewered with pieces of onion, tomato and capsicum and baked in the tandoori. Cottage cheese skewered with pieces of onion, tomato and capsicum then baked in the tandoori. This dish originated from Goa. A hot spicy dish Cooked with whole tandoori king prawn with tail, flavour of fresh bay leaves and cinnamon. A Rajestani dish cooked with home made handi sauce, yoghurt, almond, chopped onion, green pepper and tomato, served sizzling. Large pieces of duck skewered with pieces of onion, tomato and capsicum and baked in the tandoori. Let us know any preferences you may have for fish, lamb, chicken, hot, medium or mild. 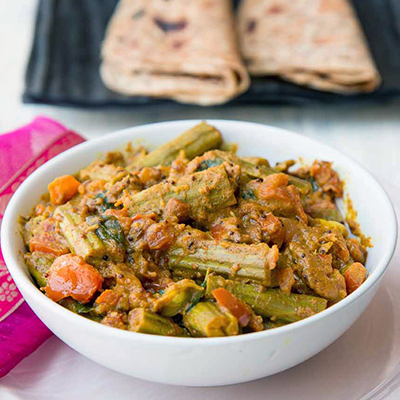 Consists of papadum, pickle, starter, main course, side dish, pilau rice, and naan. A thali is a special Indian silver platter containing a variety of different vegetarian dishes, rice, and naan.